Palliative care professionals works tirelessly to meet the comprehensive needs of those patients and loved ones who are attempting to navigate serious illness. We are laser focused in targeting gaps in care and stepping in with a full IDT to close those chasms. Working on a robust inpatient service, we rocked it. There were no divides or worries left unaddressed and unattended. Or so I thought. Then I attended a workshop offered by the Music and Art therapists, Angela Wibben and Amy Jones. I sat humbled as around me patients and caregivers, working with art supplies and jamming to tunes, shared comments such as “I feel emotions I didn’t realize I had” and “this work helps ease my pain in a way the medicines don’t”. Music and art therapy in serious illness? Seriously? Yes, Seriously!! 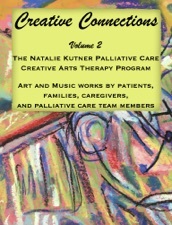 The Natalie Kutner Palliative Care Creative Arts Therapy Program at the UCHealth hospital promotes creative expression to help patients, families, and caregivers process the experience of serious illness. Through dedicated time at the bedside, the music and art therapists support individuals in using a variety of artistic media to enhance a sense of control, promote emotional and self-expression, encourage continued development of coping skills, or assist in the creation of memory keepsakes. Art and music therapists focus on quality of life, listening to patients – hearing what is important to them, while providing a supportive presence to family. The Creative Arts Therapy team has the honor of walking alongside individuals, families, and caregivers during art and music creation and while “holding space” for conversation or quiet reflection. Art and music making allows people to shed light on their inner world, revealing layers of meaning, and to feel understood beyond the limits of words and the immediate circumstances of life. The photographs and music in this compilation tell just part of the rich narrative of each individual. Please download the freed book “Creative Connections: Volume 2” linked below to read more about the interactions, behind the art and music, between patients and families and the creative arts therapy team. This book is available for download with Apple Books on your Mac or iOS device. Multi-touch books can be read with Apple Books on your Mac or iOS device. Books with interactive features may work best on an iOS device. Apple Books on your Mac requires OS X 10.9 or later.